Joel Mabus may be called a singer-songwriter, but he doesn't sound like one. He's the son of a 1930's old time fiddle champ and a banjo-pickin' farm girl. His performing career began in college during the Vietnam era, where he studied anthropology and literature by day and played coffeehouses by night. 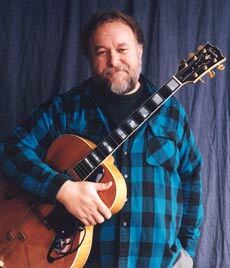 One critic writes,"Joel Mabus knows his way around the English language and American culture just as well as he knows his way around a fretboard.” Born in 1953 in the southern Illinois town of Belleville, Joel has recorded 20 solo albums of original and traditional music since his recording career started in 1978. For three years running, Mabus has been in the top 10 most played artists in the Folk Radio Charts for North America (folkradio.org) [The only other top 10 artists who share that 3-year distinction are Pete Seeger and Bob Dylan.] Joel's latest CD is 2011's American Anonymous, an album of traditional American folk songs. which has been garnering high praise from the critics. A one-off in the folk world, Mabus defies any easy pigeon-hole. His palette ranges from mountain banjo to jazz guitar -- from sensitive introspection to wicked satire. He's both picker & poet, and from coast to coast over the past 40 years this Midwesterner has brought audiences to their feet, wanting more. This is Joel's eleventh appearance at the Singing Festival.